Northwest Christian University's fifth-year head men's basketball coach Luke Jackson announces his resignation, effective immediately. 'At this time I am going to continue to pursue my business passions and spend more time with my family,' Jackson said. 'I appreciate the opportunity to have been part of a very special university. I will continue to be a friend of the NCU basketball program and the University's advancement efforts. I am forever grateful to all the players and colleagues who have had such an important impact on my life. I wish NCU success.' 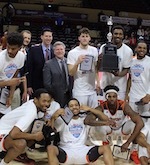 Jackson's tenure was highlighted by three trips to the NAIA Division II National Championship Tournament, including second-round appearances in 2016 and 2017. In addition, he claimed back-to-back CCC Coach of the Year awards after leading the team to its first two conference championships in 2016 and 2017. He coached five All-Americans as well as the 2016 and 2017 CCC Players of the Year (Javonte Byrd and Jay Mayernik) and the 2016 Defensive Player of the Year (Omar Richards). Mayernik went on to become NCU's debut First-Team NAIA All-American and was the CCC All-Around Athlete of the Year in 2017. He also coached the 2014 CCC Newcomer of the Year Spencer Coleman. Jackson averaged 20 wins per season. In his third year, he guided NCU to one of the best seasons in program history, winning 28 games. 'What a great ride it has been with Luke at the helm of our men's basketball program,' said Corey Anderson, NCU's athletic director. 'Luke's talent as a player, quickly translated well to the bench with our style of play, intensity and success on the court. 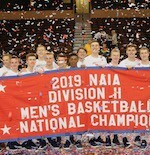 During these past 5 seasons, we have won back to back conference championships and have been back to NAIA Nationals 3 times, creating lifetime memories for those players, families and fans alike. I personally would like to thank Luke for his time and leadership while at NCU. While he will be missed, I also know that he will truly be a Beacon for life.' 'During his tenure, Luke built on NCU's storied tradition for excellence on the basketball court,' said Joseph D. Womack, Ed.D., NCU's President. 'We are grateful for his continued friendship and support of our capital campaign. We all wish him nothing but the best of success.' Current assistant coach Eddie Alexander has been named the interim coach for the 2018-2019 season.